The media was full of talk of comets with the inaugural visit of Comet ISON C/2012 S1. It was pre-hyped as being “The Comet of the Century”, being visible in daylight etc, etc. The reality of the matter is that comets are strange beasts and are rarely predictable unless they have been round a few times. 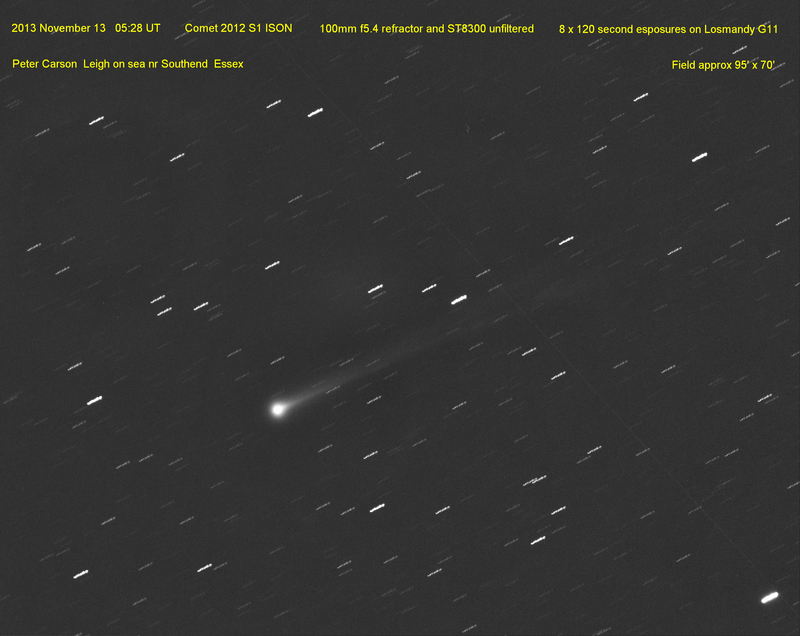 Comet ISON was spotted a long way out in the solar system and had been tracked all the time it was approaching the Sun. This meant that it was reasonably easy to predict its trajectory as it came flying in towards the Sun. The first thing that was realised was that this would be a Sun-grazing comet coming within one Sun’s width of our primary star. This was special for a number of reasons, but most especially because we now have so many instruments that are able to observe the Sun and have the capability to view the interaction between the comet and the Sun. But we are getting ahead of ourselves, first we need to understand what comets are and where they came from: A comet is a small icy body composed of rock, ice, and dust. The ice is created not only from water, but also from gasses such as oxides of carbon, etc and many organic compounds. It has been proposed that some of the water on Earth and also possibly the building blocks of life were deposited by a passing comet. Generally there is more ice than solid components in a comet, though some comets can contain more solids than ice. A suitable analogy to an earthbound structure would be that of a dirty snowball and these comets are often described as such. A comet can range in size from a few hundred feet to a tens of miles. Comet ISON is believed to be between one and two miles across, but it is very difficult to determine as the coma obscures the nucleus. Comets are believed to originate in either the Oort Cloud or the Kuiper Belt where the residue of planetary construction materials are now found. These are dislodged from their orbits by gravitational forces or collisions with other bodies and start their journey diving towards the Sun. Some comets will only visit the sun once before being catapulted out of the solar system, others will have periodic elliptical orbits returning to pass the Sun at regular intervals. In the outer Solar System, where the temperature is very cold, the comet will travel as a frozen ball. As the comet nears the Sun it starts to melt and consists of four distinct parts: the nucleus; a coma; an ionised gas tail and a dust tail. The nucleus is the ‘dirty snowball’ of rock, ice and dust. The coma is an ‘atmosphere’ formed from the evaporation of the ices into liquids which will contain suspended dust particles. The dust tail is a stream of dust particles that have been liberated from the coma and are left trailing behind the comet pushed away by the solar winds. The ion tail is formed from electrically charged gas molecules that are ejected from the coma. The two tails take slightly different paths as the ionised gasses are lighter and more susceptible to the solar wind than the dust tail. Thus the ion tail will be straight and narrow where the dust tail will curved and wide. Getting back to Comet ISON. As the comet approached the inner Solar System it started to reflect sunlight making it visible in telescopes. As the comet gets closer to the Sun more of it’s constituent parts heat up creating more ejaculate from the coma resulting in longer tails and also brighter surfaces. The theory was that as the comet approached the Sun it would brighten dramatically, making it so bright that it would be visible during daylight. ISON confounded the experts by remaining dimmer than anticipated and not becoming the ‘Comet of the Century’ as predicted. 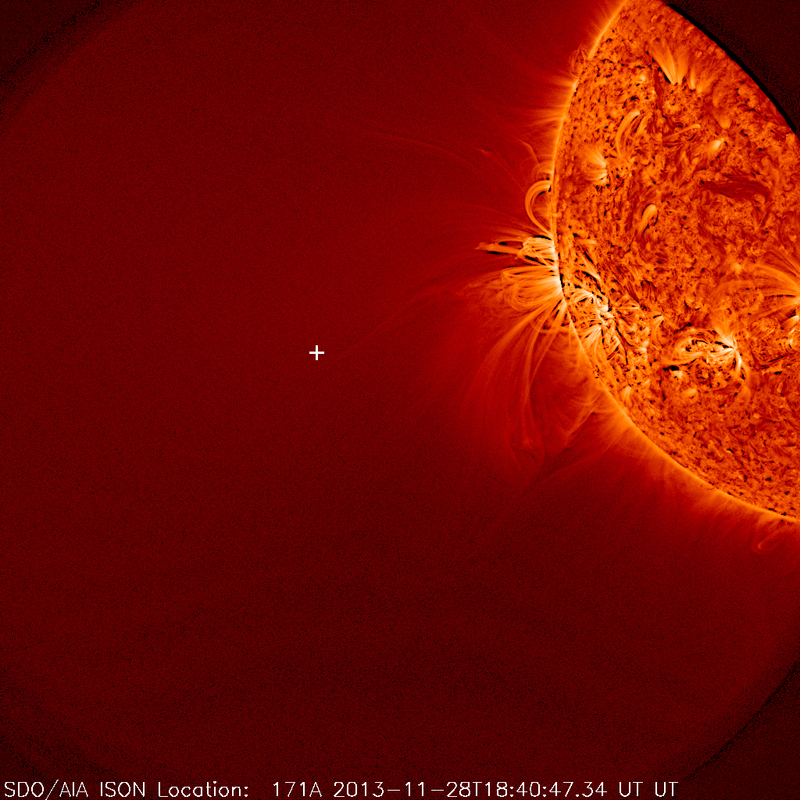 Then all of a sudden there was a dramatic brightening and it was speculated that ISON could live up to its name. The dramatic moments came on November 28th when the comet approached perihelion. Perihelion is when the comet slingshots around the sun and starts on its way back out again. As the comet approached the Sun some of the instruments observing it saw what looked like an explosion as ISON was diving towards the closest approach. This left experts thinking that the comet had broken up and vaporised as it was affected by the extreme heat of the approach. This seemed to be confirmed when the comet did not appear on the SDO instrument and even ESO scientists were confirming that ISON had gone. Shortly after the ESO announcement the comet remains could be seen on the LASCO C2 instrument looking comet shaped, but much fainter than expected. However at 12:30 UT on the 29th the LASCO C3 imagery is showing what looks like a comet, certainly more than debris heading on the expected trajectory of ISON. Whilst not as large or bright as originally expected it was quite faint compared to the comet pre-perihelion, but definitely there. This however faded to nothing a few days later, proving that comets are fickle, unpredictable celestial bodies.